A peek at the view from atop Assembly Rooftop Lounge, which rests nine stories above the Benjamin Franklin Parkway. 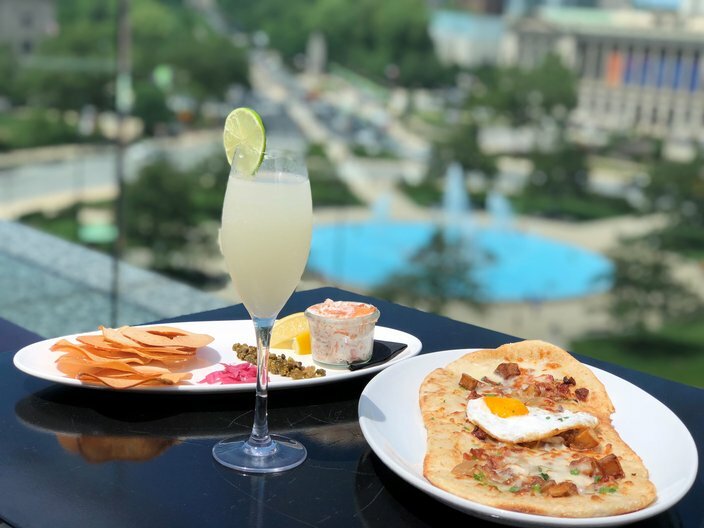 Now in its third summer season since opening on the Benjamin Franklin Parkway in 2016, Assembly Rooftop Lounge is adding brunch to its offerings every weekend. 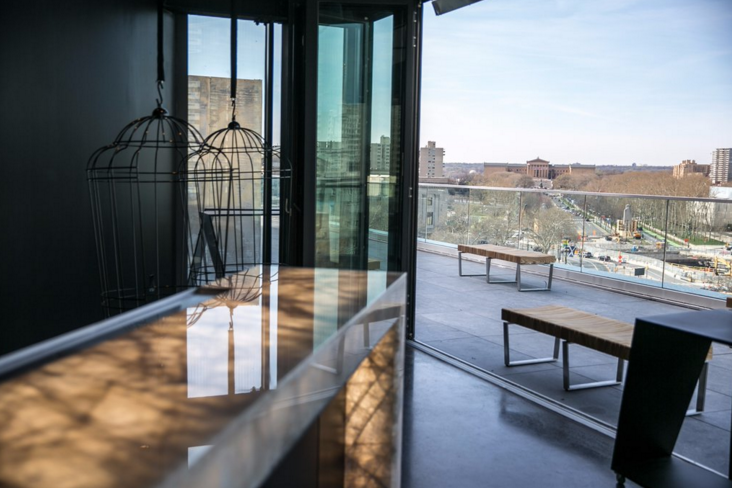 The bar on top of the Logan Hotel overlooks the parkway and is outfitted with fire pits, lush seating, fancy drinks, and killer views -- so brunch was an obvious next step. The indoor-outdoor lounge begins serving brunch this Memorial Day weekend onward, Saturdays and Sundays, from 11 a.m. to 2 p.m. The 10-dish menu is a mix of sweet and savory small plates and a collection of brunch cocktails. For food, highlights include a $12 frittata du jour, a $16 bacon breakfast flatbread, and a $12 sweet toast with banana and Nutella. Brunch offerings at Assembly Rooftop Lounge: potted salmon bagel, sparkling margarita, and bacon breakfast flatbread. For drinks, your standard mimosas are available by the class or by the carafe, though the location may cost you more than a typical brunch mimosa, with Assembly charging $12 a flute. A half-carafe is $25 and a full carafe is $50. Assembly will also offer a sparkling margarita, Bloody Mary, and three Bellinis as part of the brunch menu. The new offerings help fill the void of high-in-the-sky eating near the Parkway. Skybrunch, the all-you-can-eat, buffet-style brunch once offered 50 stories high in 1717 Arch, has been on hiatus since late 2017, though its sister site, SkyGarten, has recently reopened for the season.